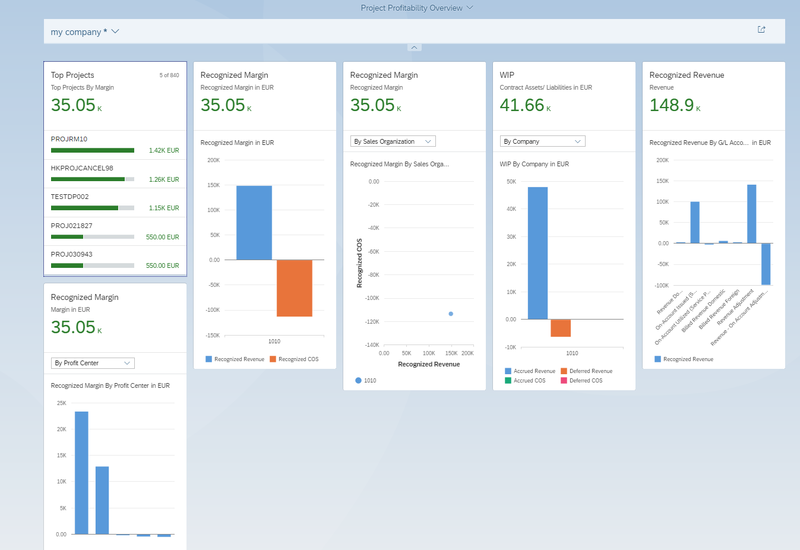 Welcome to part 1 of the blog series Financial Accounting for customer projects in SAP S/4HANA cloud. In the customer project scenario, cloud capabilities like simplified business processes and Best Practice content meet the power of the Universal Journal and event-based revenue recognition. This allows new reporting in real time – out of the box. Enhanced financial reporting features: all KPIs like ‘profit margin’ are calculated based on G/L line items in the Universal Journal as the single source of truth. Profitability attributes such as project, customer and sold product are automatically derived from within the business process. With HANA a reporting on the G/L line items is possible, which allows reporting on all provided attributes within in the Universal Journal. At the focus of the customer project application is the new App for maintaining customer project master data. 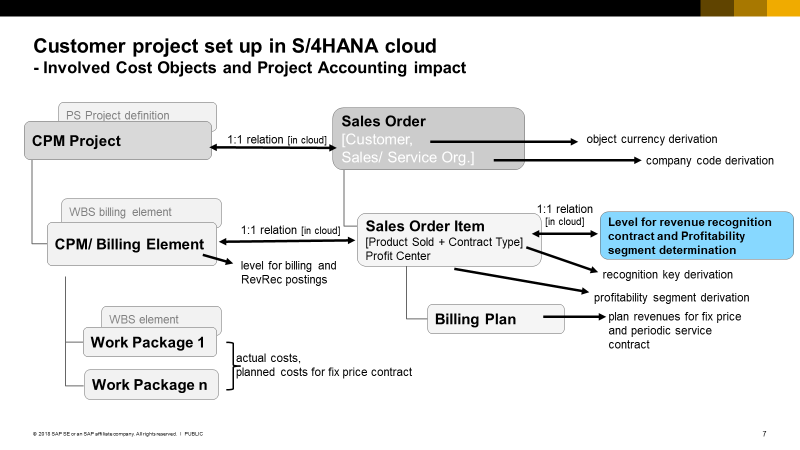 In SAP S/4HANA Cloud, there is a guided procedure which integrates all applications involved, such as sales, project management, HR/staffing and financials. This allows a simplified application integration and fulfills the prerequisite for the enhanced functionality in project accounting. In addition to this simplified customer project master data, dedicated Best Practice content enables all required subsequent business processes out of the box. The organizational data are maintained in the header of the customer project. The customer and sales organization is defined and will later be transferred to the sales order, which is created automatically. The profit center is maintained and stored in all assigned work breakdown structure (WBS) elements. In the next step you maintain ‘Work Packages’ – the WBS structure is maintained. In SAP S/4HANA Cloud, you maintain all work packages at one level. The ‘work item’ determines the kind of services, for example training or documentation. Then you conduct ‘Team’ planning of time and expenses. With the definition of the ‘delivery sales organization’ (mapped to company code) and the ‘role’ (mapped to activity type) a cost rate is derived and multiplied by the quantity to calculate the ‘cost planned’. If there is an employee staffed and staffing is confirmed, this WBS element will appear in his time sheet and controls the time confirmation process. In addition, the cost rate derivation is adapted. In the employee master data, a service cost level is maintained which can be used for cost rate determination. Based on these plan values, financial plan data are stored in table ACDOCP after customer project status “in Execution” is set. The next step, Billing, provides the integration to billing and sales order (contract). There are exactly 3 contract types provided. Based on the contract types, the billing method and the revenue recognition method is derived for this contract item. With the delivered content we ensure correct, process-driven revenue recognition. Time and Expense (T&M) contract enables billing based on the time and expense confirmations. Event-based revenue recognition simulates T&M billing for every confirmation to determine the realized revenue. Fixed Price contract. Billing is based on the amount and dates provided in billing plan. Event-based revenue recognition calculates the cost-based percentage of completion (POC). We get planned costs from the resource planning above and the planned revenue out of the billing plan. Periodic Service (used for example for licenses). This allows billing based on the amount and date provided in the billing plan. For this contract type, for every billing plan item there is a valid period required (see screenshot below). The realized revenues will be calculated by revenue recognition based on the amount and period. This will be done with a periodic run (in the example below €1000 per month will be realized). The sold product, ‘Material’ (here ‘P002’), is defaulted by contract type and can be overwritten. It is stored in the sales order item and will be derived as the ‘product sold’ attribute, and will be stored in in the Universal Journal item. From 1805 the profit center can be maintained at billing item level – as long there are no postings on the assigned WBS structure. When you now save a sales order (here ID 29754) with sales order items per contract line item are created. There is always a 1:1 relationship between Sales Order and Project ID and WBS Billing Element and Sales Order Item. That is the prerequisite to allow a derivation of a unique profitability segment and revenue recognition method at billing element level. The revenue recognition key is derived from the contract type and (optionally) from the sales material defined in the sales order item (Self-Service Configuration available). The recognition key is stored in the WBS billing element. The profitability segment is derived by the sales order item and is valid for all postings on the assigned WBS hierarchy. The WBS billing element is stored in the sales order item too. To create an event-based revenue recognition posting for every cost posting on the WBS element, a recognition key and method and also the sales order item billing plan and billing method must be available with the first posting. In addition it is ensured that all profitability attributes are available at the point of posting and can be derived and stored in the Universal Journal. 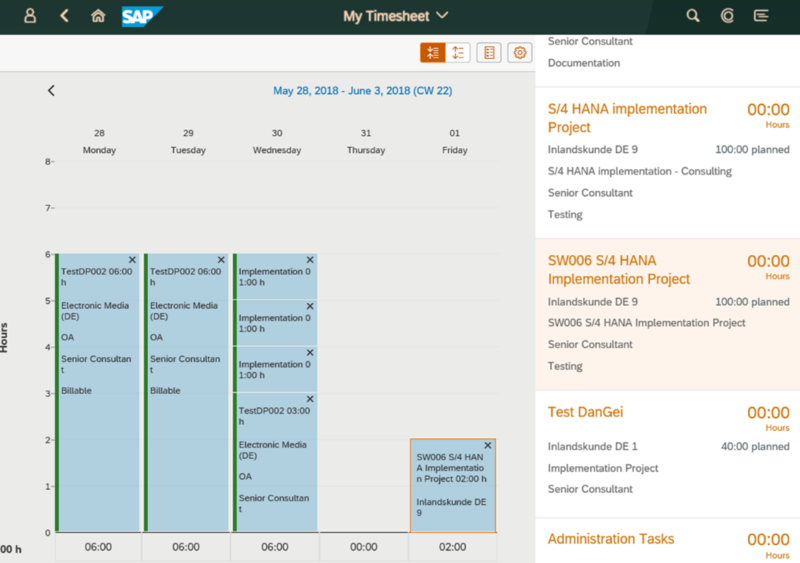 In this example we will demonstrate how a simple employee time confirmation immediately affects SAP S/4 HANA Management reporting. The process starts with a consultant`s time confirmation of 2h ‘Platinum-Consulting’ on the customer project ‘SW006 S/4 HANA Implementation’. For this Platinum Consulting activity, a cost rate of €100/h is defined. In the Billing tab in the section before the customer project is assigned to a sales order 29754 and therefore to a customer ‘10100009 Inlandskunde DE9’, in the contract item we maintained the ‘Material’, Product sold, ‘P002’. These attributes are now derived in time of posting and applied to all G/L line items posted to the assigned WBS element. As explained in the previous section, these assignments are ensured by design in SAP S/4 HANA cloud for customer projects. This leads to the following two postings, which are created automatically and simultaneously. 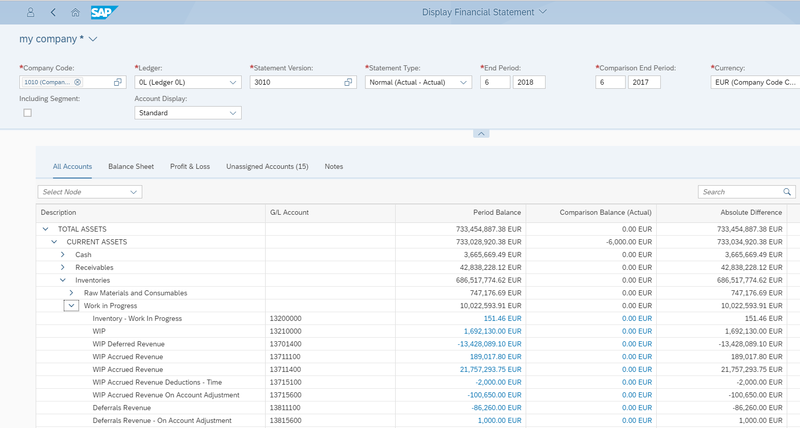 (In SAP S/4 HANA Cloud, the time sheet entries are transferred to financials direct after the entry automatically). The cost center of the employee is credited with the 2 hours and the €200 in costs. The customer project is debited with the 2h and the €200 in costs. The market segment attributes are stored in the project line item. Here customer, product sold and sales order are shown. The two line items below are created by event-based revenue recognition. In this example, accounting principle IFRS is applied, so revenues are already realized with the confirmation – on billing element level. The 3rd line item is the realized revenue, which is posted to the revenue recognition G/L account ‘Revenue Adjustment’. Remark: this G/L account will be cleared when the project is completed and the revenue is posted with the ‘Billed Revenue’ G/L account. The 4th line item is the activation of contract asset/WIP or not yet billed receivables with the revenue recognition G/L account ‘WIP Accrued revenue’. Remark: this G/L account will be cleared when the project is completed. In both line items the WBS element and the market segment attributes are stored. The field ‘reference document’ in column 3 shows that all 4 line items are created by the same origin document, the time sheet entry – reference document type ‘CATS’ in column 4 . The value of the realized revenue is defined by the contract type ‘Time and Material’ by simulating the selling price on base of the confirmed hours. In this case the selling price is 120€ per Platinum-Consulting hour. Enabled by event-based revenue recognition and the ensured market segment attributing, the project lead gets a project margin which is always current, and the business analyst gets market segment information which is also always current. In the screenshot below, you see that the time confirmation on the project ‘SAP S/4 HANA Implementation’ is already reflected in market segment reporting, influencing the margin of the product sold ‘P002’ and the customer ‘Inlandskunde DE 9’. In addition, the drilldown of the WIP value by WBS element and market segment (product sold, customer …) is now possible, as the revenue recognition postings stored in Universal Journal and their line items include the market segment. In addition to the enhanced reporting capabilities, the period-end close is considerably simplified. In the figure below, you can see which steps are necessary in ERP to calculate a current project margin reporting from the time confirmation. In SAP S/4 HANA these steps are no longer needed. As shown in the previous section, the time confirmation leads immediately to an – enriched – reporting. Based on the cost posting transaction on the customer project, the realized revenue is posted which allows a current margin reporting for the customer project. And with the market segment attributing in Universal Journal, this also immediately allows market segment reporting. Independent of period-end closing activities, a real-time profitability reporting is possible – see figure below. A settlement of revenue recognition data to General Ledger is obsolete – as event based rev rec already posted in Universal Journal. As all data stored in the Universal Journal there is no reconciliation effort between different data sources like P&L, revenue recognition data and Profitability reporting. Only one step is necessary at period-end: a revenue recognition run takes events in account which did not lead to postings during the period (such as manual maintenance of ETC/POC or a change in the project status).